Hump Day Hilarity – Al Gore's AIT Firesale | Watts Up With That? Al Gore’s book, An Inconvenient Truth used to be one of the hottest items (no pun intended…umm, well maybe) but now, not so much. While it is still being sold on Amazon.com for as much as ten dollars, it seems there is now a burgeoning discount market for AIT. And, it gets worse, some Amazon used book sellers are unloading it for a penny! October 8, 2014 in Al Gore, Humor. It would probably hold its price better if they moved it to the comedy section. …or at least the Junk Science pile. I’d like to agree. But it’s no laughing matter that many people believed in this science fiction novel enough to riot in the streets, vote for carbon taxes, lie to other that PV solar and windmills are job creators, and so on. This book has been a destructive force for most, and helped make a few very wealthy off the anguish of others. Can I use carbon credits instead of cash? Maybe if you promise to sequester this carbon and not burn it. If it ends up in my septic tank, does that count as sequestration? You are aware, I preume, that that is a spoof site? This is an amusing website which, at first, appears to be a ‘green’ site but is actually just an advert for a book called ‘Biodiesel’. Go to the bottom of the homepage and read the extremely small print. 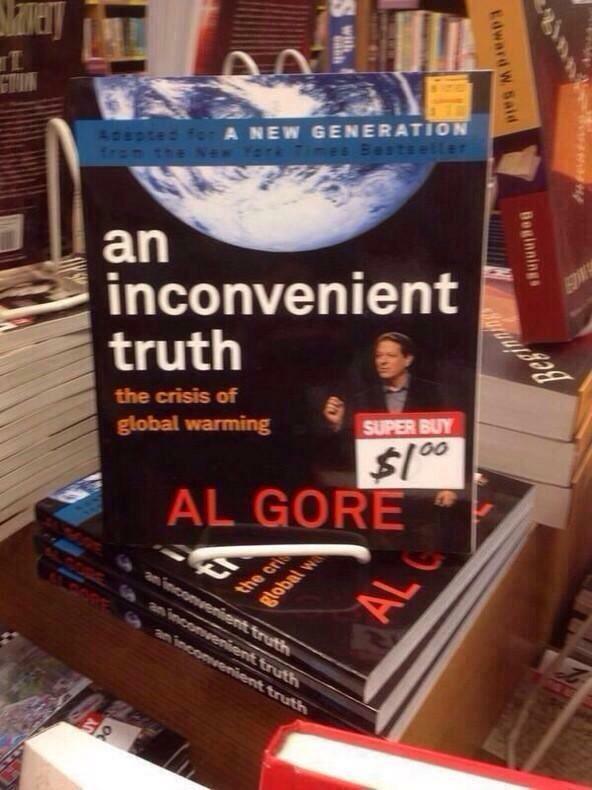 Gore’s “An Inconvenient Truth” #196,056. Amazon Unlimited is the “borrow” thing they’ve set up, right? Glad to hear of it. Mostly just want to keep law-abiding people from ending up in jail because they were unfortunate enough to be chosen as prey and fortunate enough to have won the contest. lot of good info on this site if you have not visited often. At those prices I’m tempted to buy a copy – with the rising price of heating fuel, thanks to the brutal cold weather which seems to be occurring lately, it could come in useful. Heck, I’m wondering if you can buy in bulk. Even with 5 bucks shipping? Wayne, you beat me to it. Up here in the great white north, 1 penny per copy could keep the cabin warm very cost effectively. I wonder how much CO2 would be generated per copy? Good point! At that rate, it’d be cheaper than a cord of wood, AND it would double in a pinch as toilet paper…! Don’t use it as TP! You’ll get a terrible burning sensation that’ll ruin your day. Unfortunately, you’re right for once. The important thing about propaganda is not its accuracy or price; it’s how many people’s minds are corrupted by it beyond repair at any price. Tagged as humour, I dont think so. If a warmist site made a humerous jab at skeptic book sales figures then that would be ok too. Its when people like Cook or Lewendowsky start analysing book sales and reading into it people’s beliefs in global warming it becomes a game and goes too far. Who’s got more at risk ? The fact is that a book that’s about ten years old is still well enough known that humour can be made from it. So it has been influential. (And everyone who would ant a copy probably already has one). Inevitable? Check for “The Origin of Species” on Amazon. It was originally published in 1859, and is still going strong and well worth reading. Perhaps. But most (all?) scientific disciplines have a number of works that never really grow obsolete or redundant. Just check the books any working scientist keeps handy. I’m STILL waiting for your answer to my question regarding the HotWhoppers debate, Peter, which was whether you agreed with her position or not. Obviously, you just cherry pick topics and aren’t man enough to answer a simple Yes/No question. You are just a self-serving shill when it comes to the scientific debate, sir. And I’m STILL waiting for an answer. Save, a tree. Burn an Inconvenient Truth. Only if it doesn’t work as toilet paper..
Koch Bros, The target of the green movement sells Angel Soft TP by Georgia Pacific. Retail over one dollar. Koch has a better handle on consumer demand. Fiction usually has some basis in truth, fantasy would be more appropriate. Tom wins today’s groaner award for the driest humour with “Climatyville Horror”. Made me groan out loud. I wouldn’t pay the lint in my belly button for that POS. I didn’t read the book, but I actually watched the whole film recently. I was hoping this article would list his predictions 1 by 1 and see what has really happened since the book was published. I guess I would have to buy the book for $1 and list the predictions I mentioned. I’m sure the book must make predictions/forecasts. Does it, I haven’t read it? Over representing facts (knowingly lying) to get people to listen (buy your book, watch your movie) is only necessary when you know the real facts won’t make any one care, and they won’t buy your book, and they won’t watch your movie. At that price it might be an economically viable replacement for Lewpaper. For a much more useful book at the almost-as-low price of $5, download a PDF copy of Bob Tisdale’s Who Turned Up the Heat?. The background on the ENSO process is critical to understanding his many excellent posts here. Since WTUtH? is an E-book, you can’t burn it to keep warm; use AIT for that purpose, although good old fashioned coal will give you a lot more heat for the same price, and has the added benefit of making Bill McKibben weep. Thanks, Alan Watt, Climate Denialist Level 7. They should sell it next to the Charmin! AIT weight per book (including jacket) approximately 1 pound 11oz. 5000 of them at a cost of $50.00. Run them in an incinerator. where a cord averages about 2800 pounds per cord. burning AIT books at 1/3 the cost of coal. There you go again with those equation thingees. And how does the resulting CO2 emission compare? I imagine that AIT emits much less CO2 as well, coming from Mr Gore after all (because of the low-carbon footprint example that he continues to set for us to follow). do I really need the sarc tag? I found this reference which claims 6,500 BTU / lb of “waste paper” (a description I’m sure we can agree on), which is actually slightly lower than 7,500 BTU / lb for “dung” (another apt description). If I use the 6,500 BTU/lb value and your estimate of 1.69 lb for each book I get 54.8 million BTU rather than your 60 million for 5,000 copies, but close enough. So if you can get enough copies of AIT for the cash and carry price of $0.03 each or less, you will beat or break even with the cost of coal for heating. You will also be transporting roughly 8,430 lbs of AIT to your incinerator rather than 6,000 lbs of coal. If you assume the hauling capacity of a typical pickup truck (Dodge Ram 1500) is about 1,400 lbs, you will make 5 trips to transport the 3 short tons of coal and 6 trips for the 5,000 copies of AIT. Or you could burn 8,000 lbs of “dung” instead, which means you won’t have to shovel as much s**t to stay warm. get yours before they it becomes scarce and rare. Archaeologists in some future millennia would get a laugh.. or feel sick. It could be used as a dart board in paperback form – apologies to dart boards everywhere..
31 sources for < $3.50 delivered! Now if it was printed on softer 3-ply tissue I may have an excellent use for it !!!! Hmm. That’s costing somebody some money somewhere. Somehow, I doubt that Al’s contract with his publisher contained a clause putting him on the hook for unsold units. We need a study to determine if burning “An Inconvenient Truth” is more cost effective than wood pellets. These prices have got to be less than cost – less even than the royalty Al Gore receives for each copy sold. Booksellers just should not be selling at these prices. It ought to be more profitable for them to shred the books than sell them at this price. So why are they on sale at all? Somebody must be subsidising the sale of this book. Whoever that somebody is, I really hope no public money is involved. It may be that publishers are clearing the deck for a revised edition. Sometime back over 20 years ago the tax laws were changed regarding how publishers could treat the production costs of a book. Previously they could claim all the production costs as an expense in the year they were paid. After the change publishers had to ammortize the costs of the run over the sales life of the entire production run. As a result, publishers do not keep unsold books, but dump them at any price once it is clear they are no longer selling. My wife encountered this when working for a major university library. It used to be when a circulation book became too damaged to use they simply called the publisher and ordered a new copy. After the tax change they had to start calling used bookstores and other resellers. An electrical utility plant running on unsold copies of this book would be unsustainable. Even if it was subsidized with our taxes. Think about the carbon sequestration requirements. and the best use for it. I’m a retired book publisher, and there’s no mystery here: When you see a book selling for $5 or less, what you’re most likely seeing are remaindered copies. When a book reaches what the publisher considers “end of life,” remaining inventory is written off and sold for almost nothing to remainder dealers, many of whom are now online. (They used to be tent sellers at flea markets, strip mall used bookstores, and so on.) “Penny sellers” are basically giving the book away and padding the shipping cost a little, which is how they make their money. Remaindered books are marked as such with a black felt marker swipe across the page edge. After remaining inventory is gone, a book is typically declared “out of print.” It could be heading to another edition, typically from hardback to paperback. Most of the time, the book is just dead, and rights revert to the author, who is not paid for whatever money is received from remainder houses. Obviously been deemed an ‘Inconvenient Book’ which is clogging up valuable floorspace. Actually, this is very serious stuff. The price is the real revision to the book indicated in the blue masthead wherein it says, ‘Adapted for a NEW GENERATION.’ That adaptation is for the new generation of jobless, penniless, student loan debt ridden, recent college graduates. Works for me. Is there a quantity discount ? Christmas is coming soon. Al Gore is the solution to warming. Has anyone received any grant money to study the Gore effect? This guy’s life’s work should be to fly into localized hot spots, deliver a speech thereby bringing the temp down to slightly below normal. That wasn’t a pun, d@mmit. At a penny it might be worthwhile as kindling. For a penny, it’s worth buying if only to punch a hole through one corner and hang it up in the privy on a length of string. I don’t want it even if it is free. Pelletize the remaining inventory and sell it to Britain for fuel. No point in cutting trees twice for the same stupidity. Surprised Al hasn’t thought of that already. Might make decent boiler fuel at $0.01 each. A way to recycle the carbon….lol. Still, its lies and propaganda are now being disseminated on the cheap! $0.01 is a lot to pay for a load of codswallop. back when USPS had media mail rates, you could mail that book for 2.25. amazon would get their cut, which at one penny is nothing. amazon would give you the $3.99 shipping. so, with media mail and a decent cut for amazon, you could make 1.75 selling a book for a penny. if you got a trunkload of books for a quarter each, you can make money if you are efficient. sadly, USPS has modified the ol’ ‘media mail’ class. probably too many ppl were mis-using it. but you can still make money selling a book for a penny. Ah, yes. “On the Origin of Species: The Preservation of Favoured Races in the Struggle for Life”. Now, let’s get on with the sterilization of those undesirables! Three generations of imbeciles is enough! People who stretch words into meanings that Darwin never intended do him an injustice. Favoured in this sense does not mean favored by human society or human individuals, but by natural selection. The word race in this context does not mean racial distinctions within homo sapiens, but means species of organisms. Don’t blame Darwin’s correct observations of nature and reality for the bigotry of human beings. Acceptable to a point; have you read “The Descent of Man?” Get 100 pages into it and you’re ready to rip the thing up. Darwin’s nephew, at the least thought his uncle was all for eugenics. Here is a excerpt that is chilling in its name dropping significance. And eugenics was the sciencey fad embraced by the educated self-declared elites and government officials of the day. Sort of like a certain other sciencey fad that one gets in trouble for resisting. Don’t get upset with me. Get upset with his excitable cousin, Galton. For hundreds of years, at least since the beginning of the Poor Laws, the educated elite in Britain had been trying to understand why some people don’t pull their own weight in society. Micky, if you or anyone else goes and reads about the initiation and subsequent history of the Poor Laws, poor houses, and alms houses in Britain, you will see the class issues very clearly. Darwin simply gave Galton, Haeckel, and other elitist intellectuals a convincing mechanistic theory of the way that some “races” came to be superior or inferior to others. This is not stretching words, but illuminating truth. We carry these ideas to the present day. Involuntary sterilization of inferiors was normal up through the 1970s. Well, at least here in the United States. I don’t know what country you are in, Micky. Anyone can ignore this info or begin reading. I myself simply do not trust educated elitist totalitarians very much anymore. I have seen enough. I’m opposed to book burning on general principles, but given the continued downward slide in the price, and the remarkable lack of warmth these past few winters, this is looking like a cost-effective alternative to firewood. It’s not at all uncommon for books, CDs, and DVDs that sold large numbers of copies to be sold on Amazon for one cent. I’ve bought many of them. The sellers make their money on the difference between the amount charged for postage ($3.99) and what it cost to actually mail most of these items. The reviews of the book (28 very positive, 22 very negative) and its Amazon Best Sellers rank of #115,777 are more revealing. EDIT: It’s not at all uncommon for used copies of books, CDs, and DVDs that sold large numbers of copies to be sold on Amazon for one cent. $10.12 with free 2 day shipping (prime membership) is cheapest I found (with shipping added in) on Amazon. found a paperback for 8.78 with the 2 day shipping (prime) there. Still not going to buy it. I avoid this tripe like I avoid Ebola. While I know the derision of Al’s book is justified, it is a fact this book and the movie influenced a lot of people and is worthy of note. I have reluctantly put it in my library where it joined my first edition of Nansen’s Furthest North, in two volumes, and my 6th edition of Darwin’s Origin. I am not saying it is on the same level but if you are rummaging through the scraps of history trying to figure out why the hell people did what they did, something like Al’s opus might be useful. I am certain when the global warming tide starts to go out, the story will sink quickly into the sand. The book will become inconvenient evidence of how really stupid we can collectively become. I thought we fowned on book buurning here. This one is suitable to repair a wobbly table. yes. But Burn it NO. I thought we frowned on book burning here. @RobRoy, hence the term Thought Experiment. And in reality, getting enough for a warm fire would be hard. It is just fun to fantasize. I buy excellent books on Abe and Amazon for $1 as often as possible. I would not take money to have to wade through Goreon’s book again. But the other commenters who point out that liquidating old books at $1 and less are on track: It is no big deal either way. got a few (3 iirc) newer brad thor books for 14$ total and prime 2 day shipping on amazon. there are really good deals there, people forget amazon started as book sales. I might go ahead and buy a copy and use the pages for target practice at the gun club. I will then take the torn up pages home and free the trapped CO by burning them in my wood stove. Keep in mind there may well be a tax incentive to get rid of old stock. Some fiefdoms with inventory tax started valuing unsold books at selling price rather than production cost or “remainder” selling price. So publishers were motivated to dump stock – unfortunate because some books will continue to sell but slowly. There’s also the cost of warehousing space. (Amusing side note to the bureaucracy called the publishing industry. There’s a store in Canada selling remainders of books not well distributed in Canada. Appear to be a dealer for a US operation. Typical price in their window was several dollars per book. That’s on top of the bookstore retailing stupidity that motivated the founding of Amazon company. Few got organized to order books for customers. Another dumb move was only dealing with a limited number of book distributors, which limited selection. Bookstores continue to be odd people, different stores claim different maxims for the industry, I think they are like climate alarmists – saying whatever feels good to them. Nevertheless, publishers must have badly over-estimated demand for algore’s blather. The price sounds low for remainders if it once was a strong seller. Maybe he is coming out with a new edition. All he’d have to do is substitute “warming” with “cooling” and he might get another Nobel Lariat. His Warholian fifteen minutes has finally passed.